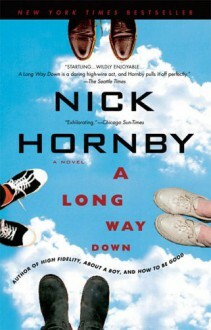 In his fourth novel, New York Times-bestselling author Nick Hornby mines the hearts and psyches of four lost souls who connect just when they've reached the end of the line. Meet Martin, JJ, Jess, and Maureen. Four people who come together on New Year's Eve: a former TV talk show host, a musician, a teenage girl, and a mother. Three are British, one is American. They encounter one another on the roof of Topper's House, a London destination famous as the last stop for those ready to end their lives. In four distinct and riveting first-person voices, Nick Hornby tells a story of four individuals confronting the limits of choice, circumstance, and their own mortality. This is a tale of connections made and missed, punishing regrets, and the grace of second chances. Intense, hilarious, provocative, and moving, A Long Way Down is a novel about suicide that is, surprisingly, full of life.